It often seems a good idea to use Rise simply to run competitions. Of course this makes sense, a leaderboard after all, derives its name and history from its use within competitions. They are designed to answer a single, question, who is winning? In many cases, such as a Golf tournament, that’s all you really need to know. However in real life, and in business, it’s not always quite so simple – in many scenarios, more than one player is winning. Take weight loss for example – if I am hitting my target weight after 6 months of dieting then as far as I am concerned, I am winning. Even if there are others who have lost more weight, or achieved their target weight faster than me, I haven’t lost. In fact we are all winners. Or, if I show the top 500 players in a certain category, such as social media usage in the United Nations, is there any real meaningful difference between player 1 and player 500? Not really! Both players are successfully using social media to engage a niche audience in their topic. Just because one topic happens to be more popular, so that player has more followers, doesn’t mean it is any more or less important than the other. Both are still winning when it comes to using social media effectively to engage their target audience. A leaderboard, a ranked list of players with scores, can be used to show not just who is number one but everyone who is playing. It can be positioned as not being a competition but more a way of displaying a list of all the players in an easy to understand order. How you design your Rise program – whether as a competition or as a gamified performance tracking (GPT) approach matters most, when it comes to the impact you want. For a competition, your impact is limited to an increase in the desired metrics (you will get more of what you want during a competition). 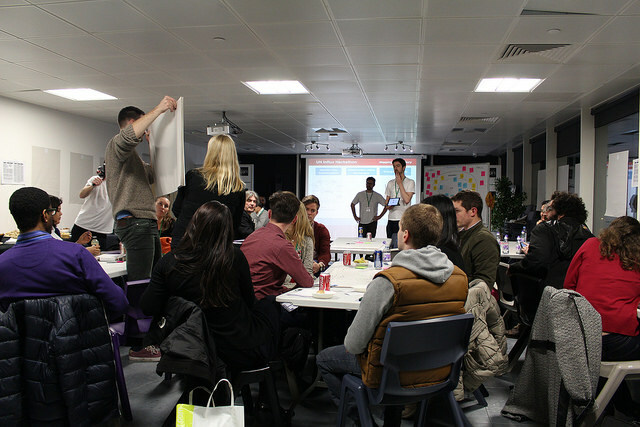 So with a competition you get impact A (more metric targets hit) but with gamification you get impacts B,C and D too! Next time you design your program, think gamification not competition. A transformative company is rethinking United Nations social media strategies with an intelligent software platform that employs gamification techniques. Smart, social and performance oriented, Rise powers the recently launched UN Social 500 leaderboard which is used to recognise, amplify and encourage UN staff to harness the power of social media. 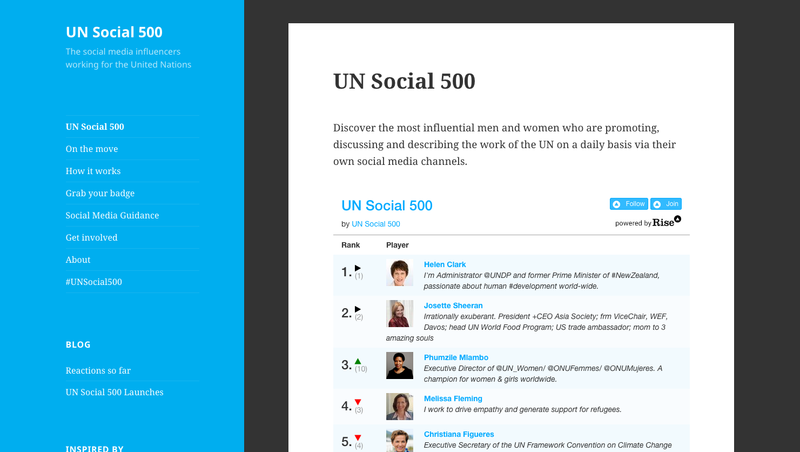 In conjunction with social analytics ranking engine Klout, Rise has developed the UN Social 500 website to honour the top social media influencers within the United Nations. Drawing on data from multiple channels, Klout issues individual social media account scores. Rise then provides personal tracking over time, comparative benchmarking with peers and an overview of which UN social media butterflies have been most successful in spreading their wings. The initial idea came to light in the wake of the UN Influx hackathon, which challenged personnel to come up with ways to “use digital innovation to connect the UN and the public more effectively.” For Rise, the solution was the launch of social media leaderboard, UN Social 500. At its core, it encourages staff to augment their social media impact and promote UN efforts via personal online accounts. The board even boasts its very own #UNSocial500 hashtag to ensure followers stay up-to-the-minute on all the latest developments. In today’s digital society social media has become an integral part of both personal and corporate communications. For an organisation focussing on peacekeeping, security, human rights AND economic development, social media is a hugely effective way to engage with global citizens. As such, UN personnel making the most of social media channels deserve to be commended for their efforts. The UN Social 500 leaderboard does just this, while simultaneously allowing members of the public to discover the most influential men and women who promote, discuss and describe the work of the UN on a daily basis. From globally recognised organisations such as the United Nations to local SMEs and expanding corporations, the latest UN Social 500 drive is a lucid example of how a gamified performance management platform can be used to motivate employees to supercharge social media presence. For businesses and organisations of any size, it’s an innovative way to boost public profile, engage with a larger target audience and ensure that social media channels are worked at their hardest. Rise is a Gamified Performance Management (GPM) platform designed to help businesses get better at what’s important to them. The platform does this by providing regular, relevant feedback in a way that’s clear, proactive and results driven. Members of the Rise community can choose to follow public or private boards in order to stay up to date with all the latest industry movements and trends. Once signed up, users can track progress against multiple metrics. These draw on a myriad of different systems and are an invaluable resource for businesses wanting to uncover how they shape up against the competition.